Kiva Zip is a website that enables financially excluded and socially impactful entrepreneurs to access 0% interest small business loans. These loans are crowdfunded by hundreds of lenders from around the world that read your story, lend you as little as $5 each, and rally around your business as potential customers, business advisers, and -brand ambassadors. Paulette lives in Oakland and makes handmade soaps and beauty products in her home. She used a $5,000 loan to purchase her key ingredients in bulk and market her brand, Sweetpeaz. 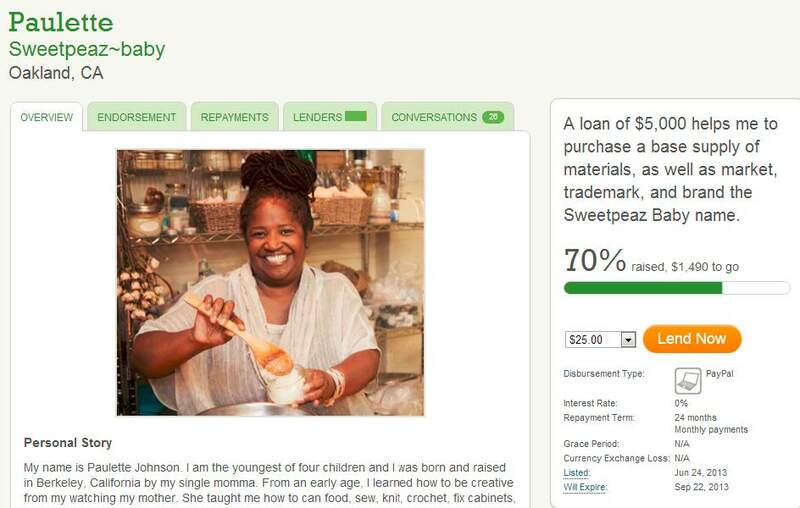 249 people around the world funded her loan in less than one month. Borrowers must be endorsed by a Trustree who can vouch for their character and business. As opposed to using tradition financial metrics, Kiva Zip evaluates borrowers’ credit worthiness based on their network. A borrower is able to fill out a loan application upon an endorsement from a Trustee. A Trustee is an individual or an organization who writes a public endorsement vouching for their character and business. Trustees are not financially or legally liable. Interested? Well, click here to get started!